Over ten years ago, I had the pleasure of corresponding with a researcher who, at the time, was almost 80 years old. John Bagby had come across my work on brown dwarfs and a possible companion object in the outer solar system over the internet, and took the time to send me some of his papers from California (1). He had been interested in similar ideas for some years, it transpired, and had written several scientific papers outlining his theories, and the evidence he had accumulated regarding candidate objects. One, in particular, ticked a number of boxes for me, and I wrote about his contribution to the field in 'Dark Star'. "An amateur astronomer who long argued for the existence of a substantial tenth planet was the engineer John Bagby. He wrote several papers outlining evidence he had put forward for the existence of a Massive Solar Companion, or ‘MSC’. Bagby was quite sure that such a body existed, and he claimed to have data to prove it, if only someone would listen to him. He shared his information with astronomers including Drs Harrington and Van Flandern at the US Naval Observatory, Dr Anderson at JPL, and Dr Marsden, who collates sightings of new solar system bodies. He also publicly presented his work at seminars and scientific meetings in the 1970s. "Bagby wrote unpublished papers between 1978 and 1980 that set out his observational data and theoretical underpinning for either a tenth planet, or a massive solar companion. He claimed that the discovery of Pluto in Gemini was located 180 degrees opposite to the massive undiscovered planet, and that the pre-discovery prediction work of Lowell and Pickering could be put down to a classical "direction finding and distance ambiguity". In other words, Lowell had been right, but had looked in the wrong direction. Planet X lay in Sagittarius, Bagby claimed. "This proposal from the late 1970s finds itself in accordance with my own analysis of the location of the Dark Star. Was Bagby onto something? Problems emerge when we come to look at his proposals about the size and distance of the binary companion. Bagby was proposing a full-blown brown dwarf in the vicinity of the Kuiper Belt. We’d be able to see such a massive object with a regular telescope. How had he arrived at this fantastic, utterly impossible, conclusion? At the time I sent you the large packet of papers, I could not find this Boston Globe reprint (9). Walter Sullivan of the New York Times called me to see if I was being invited to attend the meeting, but I certainly was not.. The subject was soon dropped from all further discussion after IRAS. My opinion is that when the UK and Dutch people agreed to let our JPL "manage" the data, it was (IRAS) heavily censored, and has been ever since"
One has to wonder, then, why was there so much secrecy over an announcement that, in the end, was so vague? Was Bagby right to be sceptical about the way JPL took over the latter part of the project, a charge also levelled against the Americans by British science journalists Martin Redfern and Nigel Henblest (11)? 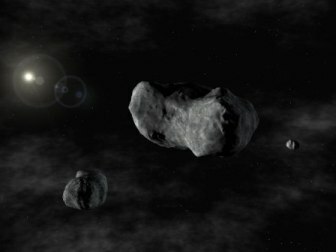 The article was published in "New Scientist" on 10th November 1983 (the day after the aforementioned NASA press conference), and discussed the discovery of an object in space by the infra-red space telescope in the constellation of Sagittarius, of an object potentially ‘several times heavier than Jupiter’. It appears as though British scientists at the time were accusing their American colleagues on the IRAS project of keeping the information of this find to themselves. The British scientists publicly questioned why the Americans had "been keeping quiet about it in recent weeks" (11). If, as is often implied, this discovery was much ado about nothing, then why all the fuss about the preceding secrecy? 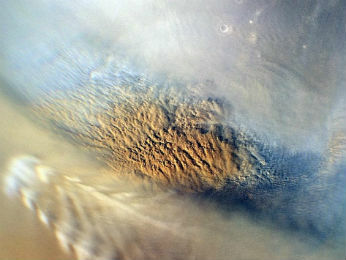 "The present-day atmosphere of Mars, composed mostly of carbon dioxide, is extremely thin, with atmospheric pressure at the surface just 0.6% of the Earth's surface pressure. 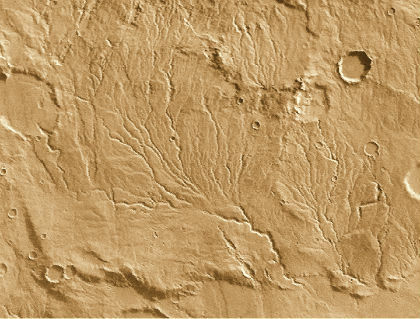 The Martian landscape, though, retains channels that were evidently cut by abundant, flowing water - proof that the planet had a much denser atmosphere in the past. Some of the air would certainly have reacted with, and been incorporated into, minerals at the surface. But the most likely explanation for its loss is that the solar wind - the great outflow of energetic particles from the Sun - has simply eroded it through time. 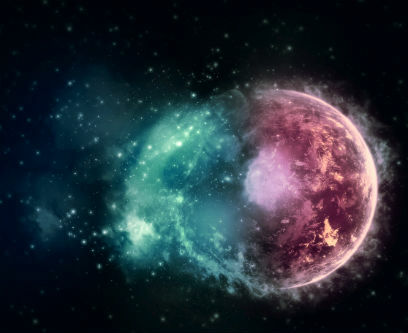 This has been possible because, unlike Earth, the Red Planet lacks a protective global magnetic field, which is capable of deflecting the abrasive assault from our star. "Some of Maven's instruments will concentrate on the Sun's influence, looking at how much energy it puts into the planet and its atmosphere. Others instruments will investigate the composition and behaviour of the atmosphere itself, and this will involve some "deep dip" manoeuvres that take Maven closer to Mars' surface so it can sample air molecules directly. "Curiosity's telephoto camera snapped shots of three rocky outcrops not far from the rover's landing site inside Gale Crater. One of them, called "Goulburn", had been excavated by the rover's own landing gear. The other two were natural outcrops dubbed "Link" and "Hottah". All three, and Hottah in particular, were made of thin layers of rock that had been cemented together. When the rover zoomed in, it saw rounded pebbles in the conglomerates and in surrounding gravel that were fairly large – up to a few centimetres in diameter. On Earth, roundness is a tell-tale sign that rocks have been transported a long way, since their angular edges got smoothed out as they tumbled. The Mars rocks are too big to have been blown by wind, so the team concluded it must have been flowing water. This dovetails with orbital images hinting that the rover landed in an alluvial fan, a feature that is formed on Earth by water flows. The best Mars scientists can do is estimate the age of the surrounding surface based on counting craters. On a large scale, the older an area is, the more craters it likely accumulates over time. "Earth's global magnetic field comes from an active dynamo - that is, circulating currents at the planet's liquid metallic core. A similar dynamo once churned inside Mars, but for reasons unknown it stopped working four billion years ago. The patchwork fields we see now are remnants of that original magnetic field. So, all of this change must have taken place around 4 billion years ago: major impacts wiping out the shielding magnetic field, thus the loss of Martian atmosphere and the subsequent drying out of the entire planetary landscape to leave it in some kind of dead stasis for the next four thousand million years. Now, that's one heck of a long time for the surface of Mars to remain essentially unchanged. Which then begs the question; why haven't the alluvial river bed surface features eroded over time through other mechanisms? Okay, so this might not be significant over a few months or years, even if NASA express anxiety about the effect it might have on Opportunity's solar panels. But over billions of years, this surely must work significant cumulative geophysical effects upon the landscape. I don't know about you, but those images of dry river beds on the Martian surface look pretty fresh to me, with their chiselled surface features and bare river-bed pebbles. Which leaves me with a quandary. We are given to understand, essentially, that Mars is some kind of museum, held in a static position since it lost its water and atmosphere billions of year ago. This might work on a planet with no atmosphere at all (the Moon, Mercury etc) but Mars evidently continues to enjoy significant atmospheric events, despite its low pressure and temperature atmosphere. So, why is its surface assumed to have been frozen in time for billions of years? My gut feeling is that the Maven orbiter scientists will discover that there is too little current erosion of the upper Martian atmosphere by the action of the solar wind to account for the long-term erosion of almost the entirety of the planet's atmosphere. Given that the Sun was not substantially hotter or fiercer in the distant past, that means that something catastrophic took place to drive change. That would support the consensus view that substantial catastrophic change took place 4 billion years ago, to essentially kill the planet. 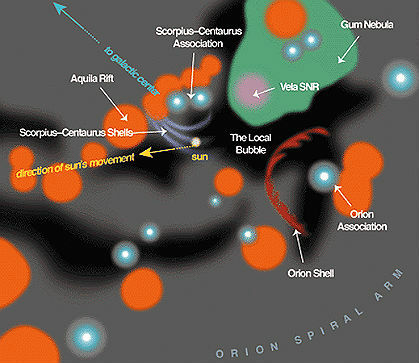 I would also add that this event, which took place during the late, great bombardment, was one and the same as Sitchin's Celestial Battle between the watery precursor Earth called 'Tiamat' and Nibiru/Marduk (6), which I contend is a sub-brown dwarf Dark Star (7). In the second quote above, mention is made of how the density of cratering can be used to age a surface region. That assumes, essentially, that the craters are not subject to the kind of erosion patterns and filling-in that occurs on Earth, causing many to disappear over long periods of time. In other words, the same issue we have considered with the dry river beds. As an alternative, one might consider that heavy density cratering might actually present the opposite picture - that of sudden, and relatively recent catastrophism. 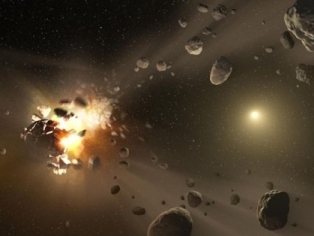 The kind of irregular but violent cataclysmic events that could also significantly erode the Martian atmosphere over a long period of time, but also reshape the landscape through the sudden release of trapped water and gas from below the Martian regolithic surface. It's not a cold war of atmospheric attrition taking place on Mars, just the usual hot war of cosmic bombardment that has created this riddle, I think. 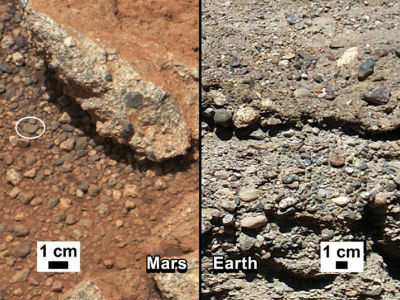 It's time we reconsider the common set of assumptions about the immutability of the Martian surface over several billions of years that tend to inform this debate. What is perhaps surprising is the dramatic size of the bubble in which we find ourselves: it transpires that interstellar space within about a hundred parsecs of the Sun is pretty much devoid of cool absorbing gas, leading to a belief that a searing bubble of hot X-ray emitting gas is to be found beyond this distance (1). Given that a parsec is about 3.26 light years, then this bubble extends out to beyond 300 light years from the Sun! Which begs the question of where the interstellar fluff is supposed to have come from that NASA argues is creating the dent in the heliosheath? If the local interstellar medium has been so comprehensively driven away by multiple supernova events 10 million years ago, then why should there be any remnants obligingly left behind at the solar system boundary? It all seems too convenient. More likely, the interaction creating these asymmetries can be explained by something far more substantial than mere fluff. "A lunar-crescent-shaped stone monument that dates back around 5,000 years has been identified in Israel. the structure is massive - its volume is about 14,000 cubic meters (almost 500,000 cubic feet) and it has a length of about 150 meters (492 feet), making it longer than an American football field. Pottery excavated at the structure indicates the monument dates to between 3050 B.C. and 2650 B.C. "Archaeologists previously thought the structure was part of a city wall, but recent work carried out by Ido Wachtel, a doctoral student at the Hebrew University of Jerusalem, indicates there is no city beside it and that the structure is a standing monument. It seems quite a lot of effort to go to if you simply wanted to mark out your territory. A monumental edifice of that proportion, and lacking any obvious defensive properties, can only have one purpose to my mind - to be seen from the air. I suspect that if Zecharia Sitchin was still with us, he would have said that this Moon Marker was one of several monuments designed to guide airborne craft into the Sinai peninsula. He believed that there was a significant spaceport in Sinai, and that some of the major ancient monuments located across the Middle East acted as way markers for spacecraft making their final approach to Earth. This seems like a pretty outlandish idea, and I for one am not convinced by the practicalities of the ancient ATC system Sitchin proposed, but there may well be merit in considering how the locals wished to express their worship towards the gods of the sky - meaning literally the gods traversing the skies above them. This huge crescent-shaped tribute in stone might be evidence of that very concept in practice. 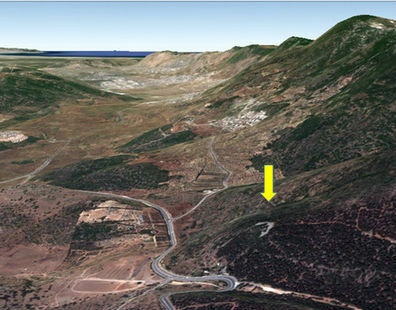 Mithram Leviah is one of several ancient sites in the Biblical area known as Geshur, which is located in the Southern Golan between the eastern shore of the Sea of Galilee and west of the fertile plains of Bashan, along the major trade routes (The King’s Highway). The name Mithram Leviah means "The Enclosure of the Lioness" and was once a densely populated city from the Early Bronze Age (3100-2200 B.C.). 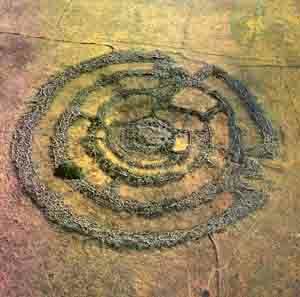 The specific area in question with the stone circles is Rogem Hiri (meaning 'Stone Heap of the Wild Cat") which contains five huge stone circles with 125,000 cubic feet of stone, some weighing as much as 5.5 tons, dating back to 3000 B.C. (5). One can imagine ancient Bedouin-style tents distributed haphazardly within the various semi-circular zones marked out by these defensive walls, providing a Bronze Age small city in the desert for the Amorites or Hittites, or whichever semi-nomadic peoples chose to occupy this 5000 year old site over time. Perhaps there was also a ceremonial or spiritual aspect to this sacred place (7), or archaeo-astronomical function to the site's location and orientation (8). What is clear is that this is a fine example of the sort of stone circular structures distributed across the Levant (and down as far as the Southern countries of Africa); one that was evidently used as an ancient Bronze Age settlement. "During a visit to Somerset England in 1983, I took a trip with my Father to Glastonbury, to climb the Tor, and see the remnants of St. Michael's church, a roofless tower, on top of a 518 foot hill on the outskirts of this small market town. While walking around the Tor, we noticed terraces cut deep into the side of the hill, and we later learned that the terraces are part of what is believed to be an ancient pathway from the Bronze age, running around the hill, and conforming to the design of The Labyrinth, the Cretan spiral of Minoan legend. 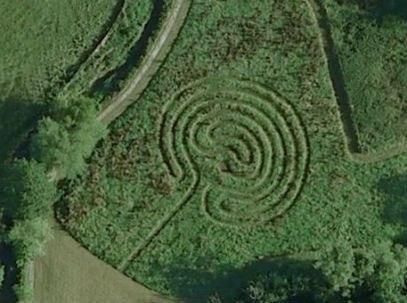 What struck me about the spiral pattern of this formation near Coventry is how similar it was to those carved into the Cochno Stone near Glasgow, which I described a couple of months ago on http://www.andylloyd.org/darkstarblog16.htm. It's amazing how frequently these spirals are appearing at the moment, and I wonder as to what links them all together. Most likely they are another piece of evidence indicating the migration of ancient peoples and the inter-connectedness of cultures that were previously considered to be isolated from one another. 3) Duncan Gibbons "Mystery of strange pattern in ground near Coventry" 19th September 2014 http://www.coventrytelegraph.net/news/coventry-news/mystery-strange-pattern-ground-near-7800277 thanks to Lee, and to comment on this webpage by Scotty Matthews. "Did you know there is a photo of Planet-X on the Internet? I saw it from Los Angeles at the same time it was photographed from a ship off Brazil, on 16 January 1958. It Appeared to be close to them in the atmosphere at the same time it appeared to be close to me in the atmosphere. At the same time there was a similar report in Clearwater, Florida. There must not have been anyone looking in Bethlehem, because I know it did look close there too. I Know it is Planet-X because it traced out an X in the sky. It traced out the symbol for the Star of Bethlehem (that is not the symbol for a Fish). Of course astronomers did see it. One observatory in Australia published a photo of it in the Los Angeles Times around 1969, before it was seized by the Church of Einstein. Planet-X seemed to me to be about the size of Saturn, with a bronze ring, and a tiny star in its core, a thousand times brighter than the Sun. The main surface could be viewed when the bright light was shielded by the ring. The surface had colored stripes like Saturn but the surface looked exactly like the surface of the Sun, it had sunspots. Planet-X made a hairpin orbit around the Sun. It appeared to almost touch the north and south poles. It moved so that its north pole was the front and the ring was on the side, as it passed over the Sun's poles the ring was parallel to the Sun's pole, when it came even with to the Sun's equator on the far side the ring was parallel to the Sun's equator. Coming to the horizon Planet-X passed behind a telephone pole 10 feet from me, it was twice as wide as the pole. 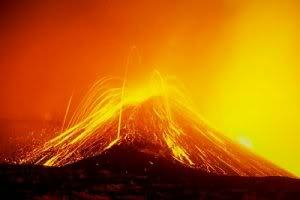 Planet-X also emitted such a strong magnetic pulse that "the rocks cried out." When the pulse hit the Griffith Observatory the quartz lens in the telescope beeped and screamed so loud it could be herd (sic) for 20 miles. The rocks also glowed pink. I got a sunburn on my back from the star in the planet, a 4 inch wide stripe across my back. The heat felt like 600 degrees, and lasted about 10 seconds. At the time of the "WOW Signal" I was in the Smithsonian Museum looking at a big crystal ball when it started blinking extremely bright pink and beeping, the beeping and flashing became faster until it glowed continuously and made a noise like 40 metal chairs being dragged across the floor (there were no chairs there). Then it slowed down until it stopped."